These two adorable pot samples came with my last Rouge Bunny Rouge order. 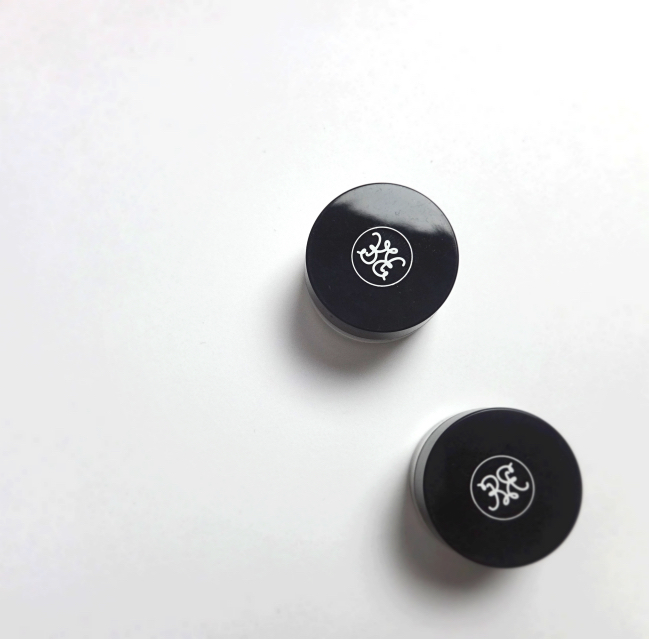 Both contain enough for me to learn about the products, and obviously Rouge Bunny Rouge went extra miles for these sample containers with their logo and the printed labels attached. I like that. Sampling them didn't lead to an additional purchase (I am on low-buy lately), but I occasionally reach for them whenever I feel like some extra glow. Not exactly the colors I would choose for my full size items, but they are pretty nonetheless. Embrace of Cashmere is a shimmery champagne flashing a tinsy bit of green. The texture is very fine and even creamy yet it does not crease. I usually just put a little bit on my lid space blending with my finger for subtle definition and finish off with some eye liner and mascara. I personally would prefer something more distinctly taupe if I am to use a single color on my lids, so maybe I will pick up Caress Of Mink in the future. 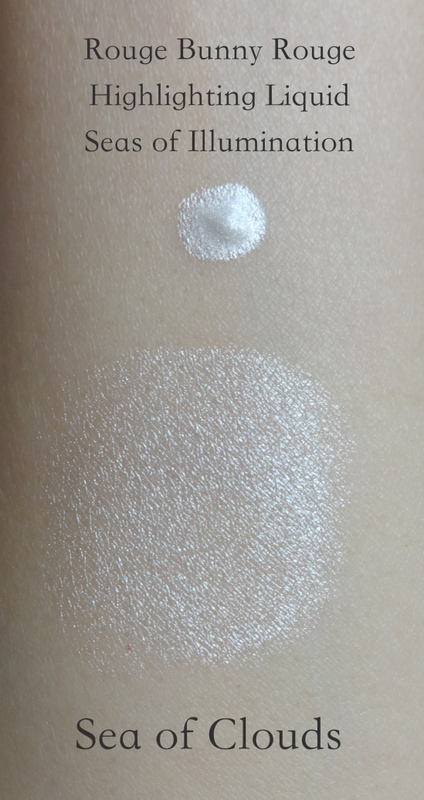 Here is another swatch photo with both (because I forgot I had taken the pictures above before and took it again). And I put together a very simple look using Embrace Of Cashmere and Sea Of Clouds. Believe the glow. 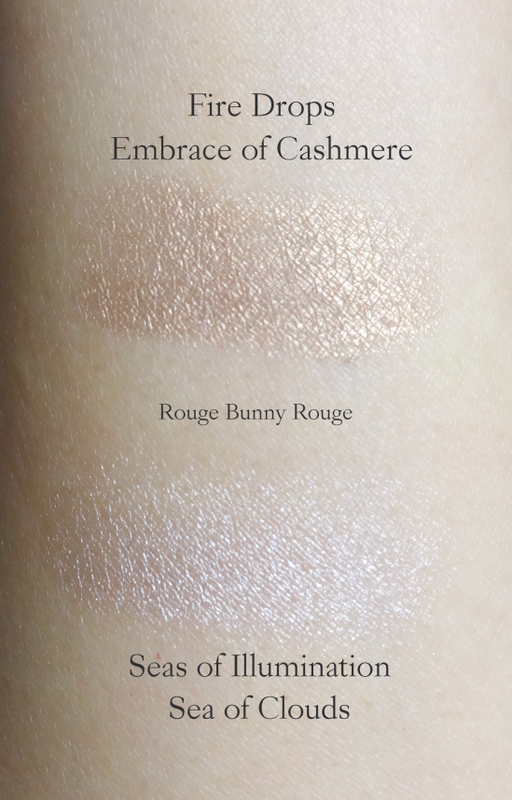 Embrace Of Cashmere is also very handy to blend out a dark cream shadow and add more dimensions, as well as Sea Of Clouds to liven up my face when I skip foundation. They seem to be impressively long lasting even in the hot humid conditions. 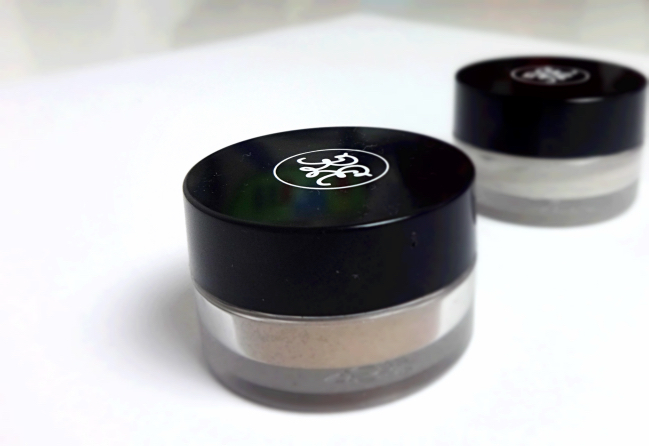 Have you tried these from Rouge Bunny Rouge? What are some of your favorite pigment and liquid highlighters? I've realised a while ago that I don't use highlighters much. So, I've been going ooh and aah when I see those beautiful highlighters, liquid or powder... but I know never to buy them. I have, I think 2 or 3 highlighters, but I know that'll last me a lifetime! Hahaha! I have Sea of Clouds and I looooooove it! It is one of the best highlighter I've ever encountered. The texture and finish are just divine.. The finish looks really nice on you Lena! These look lovely on you, I have EOC and use it a lot and had a sample of Sea of Clouds which I really like but prefer Sea of Tranquility on my skin as its got that bit of pink to it, RBR make such lovely liquid highlighters it would be great if they came out with some more shades. I love how almost wet and silky the loose pigment feels yet it stays on! I think Sea of Tranquility would suit me better as well not to mention it seems to create a more subtle type of glow. I wouldn't mind having a bottle of Sea of Clouds, though! They seem very different in their unique ways. Ahh so pretty! You look stunning! Very elegant and put-together. 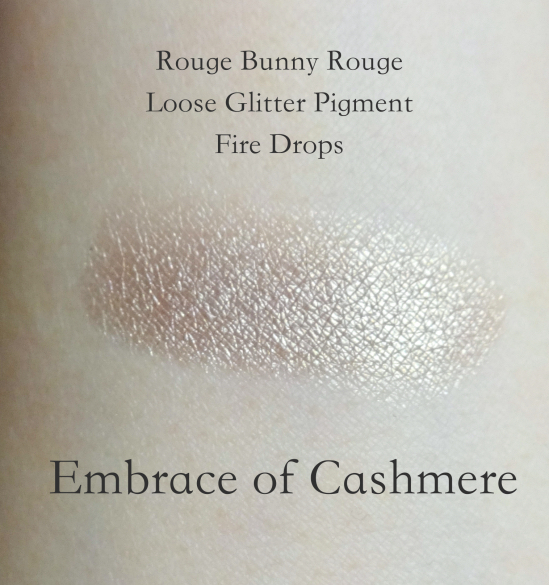 I have Embrace of Cashmere and it's just stunning :) It's about the only loose eyeshadow that I am willing to use. I have samples of all their liquid highlighters but I haven't really tried them, because I am not very big on highlighters in general. I can't say I always wear highlighters but I sure like highlighters better than bronzers. It seems those three function all uniquely different, and I think the warm color (Sea of Showers) would look beautiful on you. RBR has relatively smaller selections and seems to be quite careful with how they expand their lines, which is why I think their makeup is pretty much always on point! The Sea Of Clouds colour is so dreamy! I haven't seen anything like it that is just like that and doesn't cost an arm and a leg! Isn't it so pretty? ;) I still wish it came in a smaller container and costed a little less since you only use very little of it each time, but you're right - I think it is one of the best liquid highlighters out there! Oh, wow - both look heavenly. RBR names crack me up but I have to admit they're fitting in most instances! I love those Persian cucumbers and eat them almost daily but I do not like cucumber scent in my cosmetics. Period. Yet I might make an exception and end up with a bottle of this. It IS nice. Oh they look amazing Lena!!! That's fantastic they gave you such samples and in nice little jars! 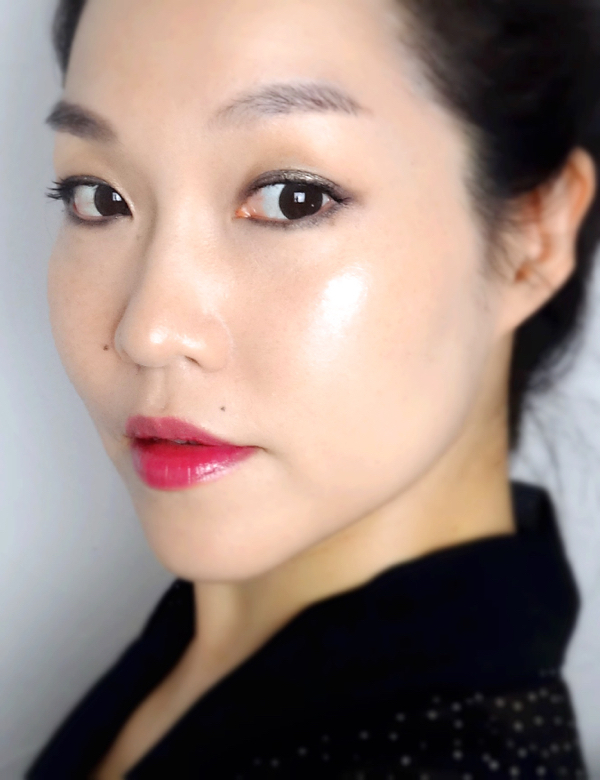 I'm always up for a good cream shadow and that illuminator although white is just gorgeous! I totally would love to own one of that tone! Gorgeous! But like Lily, I rarely use highlighters. I don't know...I just forget? Or don't care most of the time hahaha! I guess what you need is a cream blush duo that has a highlighter in it (but I think you already have some..? ;p). I do reach for a highlighter on a day I only wear sunscreen with white cast (like the day I took the pic) otherwise my skin would look so flat and lifeless. Very lovely and polished look you put together, Lena! Love! Wow, Sea of Clouds looks so gorgeous on your cheeks, Lena! I love highlighters, I need to check out the RBR website to see how expensive it is!